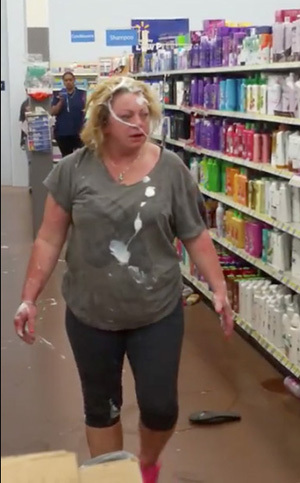 The second woman involved in the notorious Indiana Walmart shampoo aisle fight has been arrested for her role in the scrap, video of which recently went viral. Rebecca Mills, 39, was collared yesterday on a misdemeanor disorderly conduct charge for brawling with Amber Stephenson inside the Beech Grove store on June 4. Mills was booked last night into the Marion County jail, where the adjacent mug shot was taken. Mills tangled with Stephenson, 34, after alighting from the motorized scooter she was driving across the suburban Indianapolis store. As seen on videos of the fight, Mills got the worst of the 10:30 PM brawl, and even endured punches and kicks from Stephenson’s six-year-old son (who also threw items at the prone Mills and, as seen below, doused her in shampoo near the fight’s conclusion). Stephenson was arrested last week and initially charged with felony child neglect and contributing to the delinquency of a minor. A misdemeanor disorderly conduct count was also subsequently filed against her.